After many months of building and testing, the team at Skrilla is very happy to announce that our esportsbook has launched in Australia! We are really excited to be able to show you what we have been working on in our quest to provide the best esports platform around. 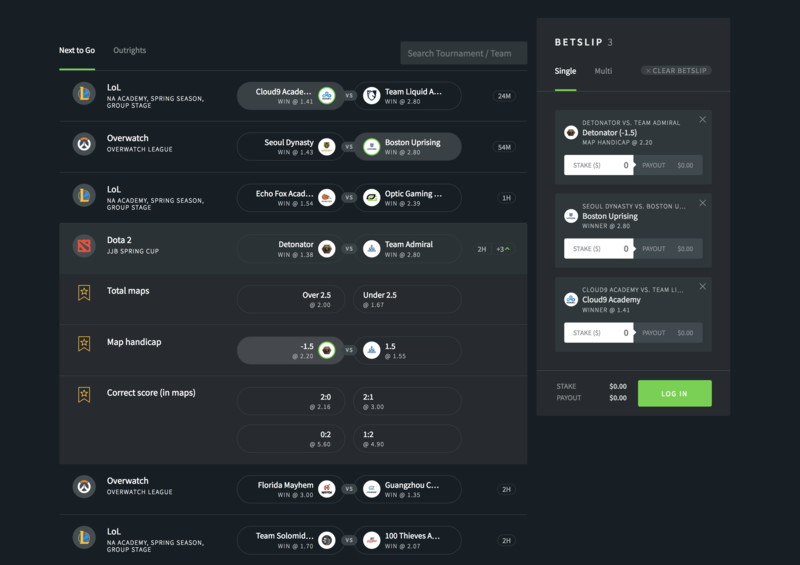 Esports betting is now live on the website and you can access it by going to the “esports betting” tab on our website. Currently we are only offering betting in Australia using Australian Dollars (AUD) but don’t fear, we are in the process of getting licensing sorted that is going to let us expand into many more countries very soon. If you want to start throwing some bets down, head to the esports betting tab on our website and have a look at the markets we are offering. Currently we are offering markets on Dota2, League of Legends, CS:GO, Starcraft 2, and Overwatch with plans to add Call of Duty, Fortnite, PUBG, Rainbow6, Hearthstone, and Rocket League in the near future. You can filter the games you want to see across the whole site (including fantasy and our new esports news section) by clicking on the Skrilla logo and selecting a game from the drop-down menu. We have added exotic markets to some of our titles, you can access them by clicking the little green arrow next to the match you want to bet on. Currently we offer map handicaps and over/under markets on the total maps for CS:GO, League of Legends, and Dota2 with plans to add many more exotic markets. We have also added outright markets for those of you who are confident enough to pick the winner of a tournament. Once you’ve decided what you want to bet on, all you have to do is click on the teams or markets which will add them to the betslip. Then you decide whether you want to bet on them one at a time or combine them all into a multi-bet for boosted odds. Once you’ve done that, you put in your stake and place the bet, easy as that! If you want a more in-depth guide into how to bet on our platform, check out our “How to place a bet using the Skrilla platform” user guide.